I truly love 5 minute Friday. If you have never…you should… just try it today. It only takes the obvious 5 minutes…well unless you are like me and you add pics after the 5 minutes is up…but the 5minutes is in regards to the writing…right? Right. 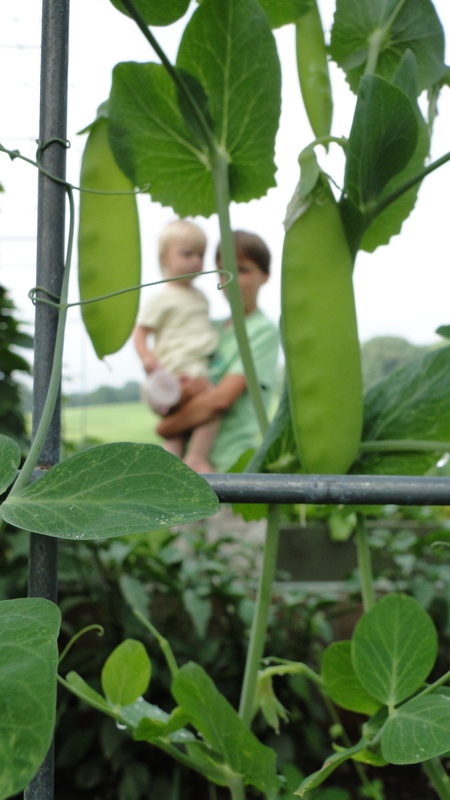 I walk through the garden with my youngest child. 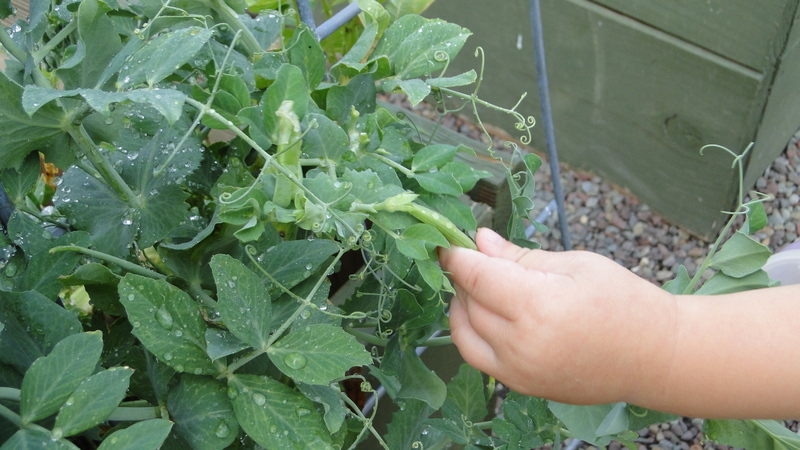 Only 16months old but when I ask her to pick a pea…she cheerfully rustles through the cool vines and pics a light green pod. She thinks better of giving it to me and crunches it down with her few teeth and picks another for her momma. 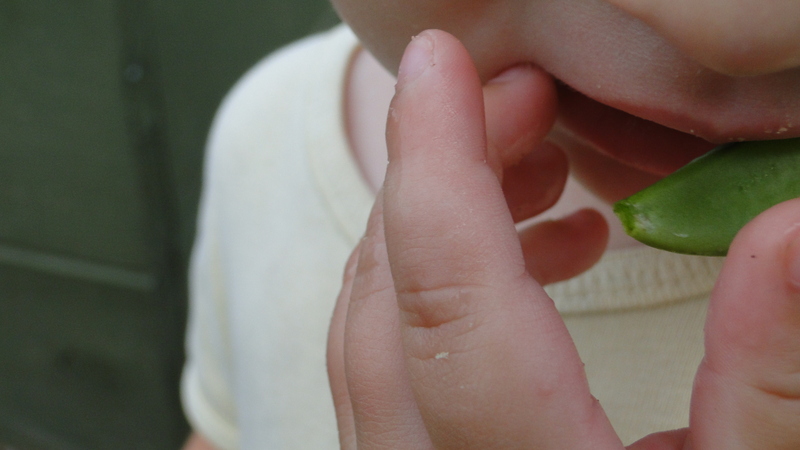 She didn’t hesitate..she knew which were the peas…it doesn’t cross her mind to pick an onion or a pepper or even something off the green bean vines…she knows. She has walked with me through our garden nearly every morning this spring and now turned summer. She sees the pretty flowers and sniffs them and doesn’t pull them off. She knows these things because she has followed me and watched what I do. I wonder if that is why God seems to tell everyone to “just be” these days. Have we all wondered and wandered around harmlessly and inactively for so long that He is drawing us close and asking us to just sit in His love because we just don’t know Him. Us who have written volumes on Him …Us who could modge podge the earth with all the sheet music declaring our love in songs and speech…we just don’t know Him…enough. So He seems to be everywhere telling everyone to tell everyone else; just be in His love and feel His presence. I wonder if the thing which God is telling everyone…telling His people, is because we don’t really have a firm relationship with Him. We think we do…I think I do… but if we truly were in sincere actual relationship with Him would we be sitting around writing books about how to work in His Kingdom…or would we,if we really were in relationship with Him, would we know His ways and not sit in cozy nooks wondering what to do but acting as one does when they are in true relationship…and actually do the things He has called us to do. There is so much to do. So much else to say on this subject. My fingers can’t keep up with my mind. But if you have a 5minute friday I would love to read it ….so link to it in the comments. 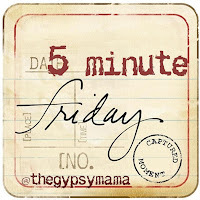 IF you have never 5minute Friday you really should. You maybe amazed at what types out. What a humble, simple-sweet reminder of what a life of faith is all about. Just being with God. That’s it – just being. Nothing else is required of us who follow Christ. Thank you for sharing this, and for stopping by my 5 minutes as well! The just being, for sure… but also through that we will be inspired to do things for Him. there is, indeed, so much to do! I so enjoyed your thoughts and wonderings today. Oh I know Kristy…my whole life our parents were (Still are) in the mission field…and truthfully I know very few people willing to work beside them. There is enough work for everyone…sigh. really?? Thank you so much. I am touched. Wandering with our children helps us to Wonder! And the place I feel the closest to God is when I am experiencing nature. Lovely post:)! Thanks for this post. It has me thinking. Sometimes I think we would rather sit and talk about what we should be doing because the doing is hard. It involves flesh crucifying, daily. Only with grace and the help of the Holy Spirit is it possible. That is so true. Thanks for this today. Lovely post – love the idea of the acting flowing naturally out of the relationship. Like marriage…when i got married I didn’t know just the way my husband liked things… But as our relationship builds and deepens I know more and more his likes and dislikes ( and he with me) and he doesnt need to tell me … I do things out of my love and relationship with him….same with God…as our relationship with Him becomes more of a relationship we should be doing more out of love and the acknowledgment of what we know He desires of us. I really enjoyed this post. And the pictures were lovely! I felt as though I was walking through your garden with you and your daughter. The fact that you called my pictures lovely… Makes me smile. I am so touched that you stopped by and walked through the garden with us. I loved this. I’m dwelling in the aftertaste of truth and beautiful words… and even though I have an active pair of baby legs to chase, I’m hoping that I will find my way back to the side of my Father more frequently each day. To just be.